Stardock (Canada) - ZineWiki - the history and culture of zines, independent media and the small press. Stardock was a science fiction and fantasy fanzine founded by Charles R. Saunders, and published on behalf of the Ottawa Science Fiction Society (OSFS). Contributors of writing included John Bell (Borealis), Michael Danagher, Charles De Lint, Gordon Derevanchuk, Galad Elflandsson, Albert Manachino, and Spider Robinson, among others. Interviews with writers such as John Brunner (Noise Level) were also featured. The story "The Nooseneck Hill Horror" by Michael Danagher is considered by Edward P. Berglund to be an integral part of the Cthulhu Mythos. 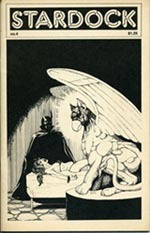 Chales Saunders was also co-publisher, with Charles de Lint, of Dragonfields. This page was last modified on 23 April 2016, at 13:40.